Any Festival approaching nearby? or a friend’s wedding coming up? forgot your special one’s birthday? and want to re-kindle up. Well here might be a chance to explore the various choices to gift something unique and enriched with love. Indibni recently launched a brand introducing “INDIGIFTS”. In a conversation at length with the founder Nitin Jain, he shares us an insight on how Indigifts can create a difference in the lives of the people. What is the business idea behind Indigifts? Indigifts specializes in relationship based gifting products. They make sure that their gifts give the right experience to buyers, and evoke feelings in the receiver. At Indigifts they use design process for making gifts, for example, they have designed one kitchen door sign for mother which quotes “Mummy Da Dhaba 24×7 open”. It has a story, connection with the relation, a personalized touch and utility. Nitin Jain – The think tank; he did his postgraduate in Animation and Design from BIT, Jaipur. His works have varied from animation to branding and have a diversified portfolio of working for Startups, MNC’s, International Festivals to NGO’s. He refers hismself as a foundation stone, and call him as “The Creator” at Indibni. His Key Role is Ideation & Planning. Ankit Jain – The back bone; He did his graduation in animation and multimedia from BIT, Jaipur. He is skilled and experienced as a Vfx and 3d generalist with a number of films like Yamla Pagla Deewana, Kahaani and corporate ads for SBI Life Insurance, Mankind, and Carlsberg etc. They call him as “The Executor” at Indibni. His Key Role is Operation & Production. Khushbu Mathur – The Fragrance; She did her UG Diploma in craft and design from IICD, Jaipur. Her working experience with NGOs, Social Enterprises, MNC (TATA Motors, Pune) has contributed to develop her understanding of user needs, market size, product development process etc. She is “The Transformer” of Indibni. Her key role is a Process & Development. 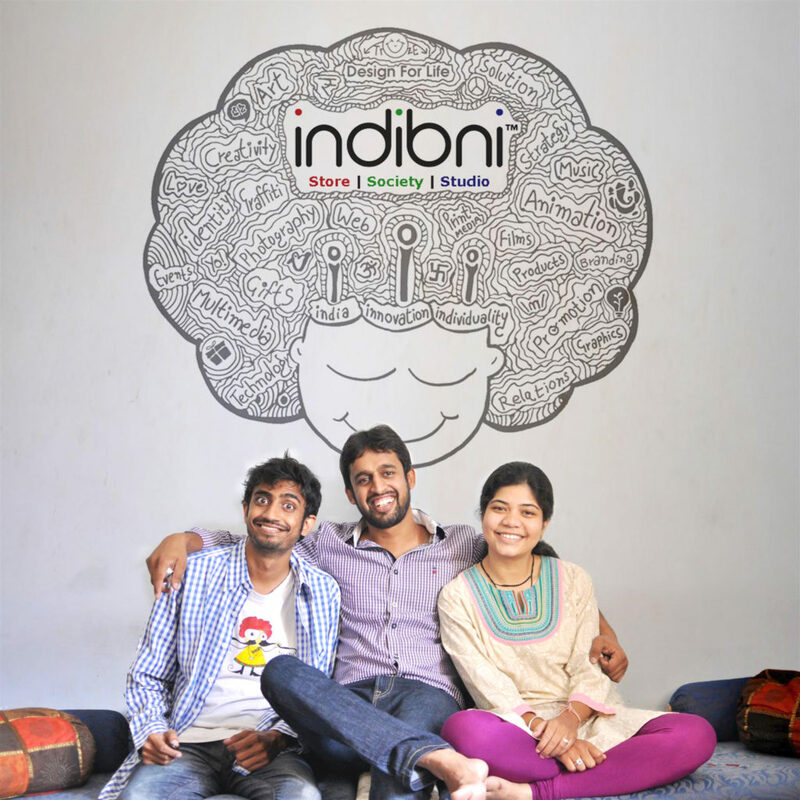 The parent company Indibni Started in 2012, as a Design Consultancy for branding and merchandising. They have a strong portfolio of Customers from 15+ Countries; Multinational Corporate Houses 3M, Owens Corning, NBC; Celebrities like the Bachchan family, Oscar winner film maker Marc Bachet, Late Vargish Kurian, Anna Hazare; Startups such as Kallista, Sportsgram etc. ; NGO’s like Akshaya Patra Foundation, BITOSA, Rotary Club etc. and more. They launched a sub brand, Indigifts for catering the Gifting Market. They are focusing on making relation based, ready to buy gifting solutions; every product has a story, utility and experience for buyers and the receivers. They are looking forward to develop Indigifts as a platform where we can bridge and art, artists and application. Nitin says, one of the biggest challenges we faced in our initial days was not able to achieve the target sales during target season (Valentine’s Day). We did everything made good products and placed it on various online and offline channels but to be honest, we were not able to achieve 10% of our target. Luckily we had mentors and under their guidance, we did deep analysis and able to pinpoint the problems. And to overcome the same we started doing proper Homework (Research and Planning) and Documentation (Keeping the Track of Progress). Business model with or without funding. Future Plan of expansion in next 2-5 years vision. They are targeting NRI’s and people who are interested in Indian culture and craft; as the soul of every Indigifts product is Indian culture i.e. adding values in relations. Everyone is innovative and has a skill set; Find your goal, hunt it down, make it your slave and keep it alive inside you. Don’t just look & hear, try to see and listen, observe more and connect yourself with nature. Be tactful, the end product is not only your opportunity, it’s your team’s hard work, well wishers’ blessings & critics feedback, which helps you to grow. It’s necessary to have mentors, they always guide you; support you to make your vision a success. Finally, Pehla sukh nirogi kaya, Health is wealth, don’t overdo work, drink more water and eat timely.